The Nevada probate process can be long and expensive. On the short end, a full probate administration can take 6 months. If there is a will contest, it can take years. And between attorney fees and other expenses of administration, probate can cost $6,000 – $8,000 on the low end to tens of thousands of dollars on the high end. Because of the time and cost, and the general headache factor, people want to avoid probate. There are different assets that avoid probate. And various methods for avoiding probate. Life Insurance – Life insurance is a contract between the insurance company and the insured. Beneficiaries are listed on the contract. Upon the insured’s death, the insurance proceeds are paid directly to the beneficiary. Pay on Death Accounts – Also referred to as ITF (in-trust-for) accounts, this type of bank account also pays directly to the person named as the beneficiary when the account holder dies. Joint-Tenancy – Real property held in joint tenancy with rights of survivorship, by operation of law, becomes the property of the surviving joint tenant upon the first joint tenant’s death. This doesn’t really avoid probate, but rather delays it until the survivor’s death. Death Deed – Real property in Nevada may be transferred upon death without probate by using a special kind of “transfer upon death” deed. This special deed lists a beneficiary much like a life insurance policy or POD account. 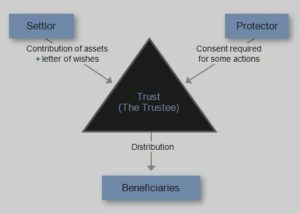 Living Trust – Holding assets in Trust is a common probate avoidance technique. The Trust is a very flexible tool that allows you, when done properly, to pass your estate to the beneficiaries you’ve named in the Trust. Wills do not avoid probate! A common misconception is that probate applies only to those who do not have a will (or trust). Even though wills name an executor and list beneficiaries, the assets held in the decedent’s name at the time of death must still pass through the probate process in order to transfer title. A valid will gets admitted to probate and becomes the court’s roadmap for directing to whom the assets are to be distributed. In order to avoid the costs and headaches of probate, call for a free consultation.